This is a complete fuel line assembly for any Johnson, Evinrude, OMC or Bombardier Engine. Includes our high quality primer bulb, premium A1 hoses and the engine and tank connectors. 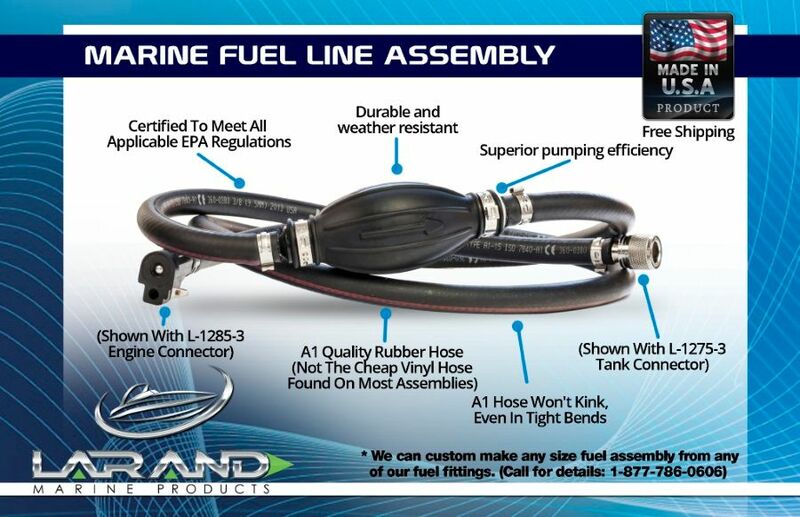 This is an EPA – CARB Compliant FUEL LINE ASSEMBLY & Made in the USA! This Fuel Line Assembly Replaces OEM PN: 398549 & 176748. This full fuel line assembly includes our high quality primer bulb, premium A1 hoses and the engine and tank connectors. The fuel line hoses are the standard 18 inches to the tank and 54 inches to the engine. (We can custom make these hoses to any length you want and usually in less than 24 hours. Please call 1-877- 786-0606 for more information. ) Pictured below is what a full fuel line assembly looks like.